Тра­ни­ласт, ста­би­ли­за­тор мем­бра­ны туч­ных кле­ток, сни­жа­ет со­дер­жа­ние мо­че­вой кис­ло­ты в кро­ви, по­дав­ляя ос­нов­ные ре­аб­сор­би­ру­ю­щие транс­пор­те­ры ура­тов. Мо­че­вая кис­ло­та, про­дукт пу­ри­но­во­го об­ме­на, иг­ра­ет как хо­ро­шо из­вест­ные, так и недав­но от­кры­тые ро­ли в па­то­ге­не­зе раз­лич­ных за­боле­ва­ний че­ло­ве­ка. Уро­вень мо­че­вой кис­ло­ты в сы­во­рот­ке че­ло­ве­ка опре­де­ля­ет­ся ско­ро­стью ее син­те­за и раз­ни­цей меж­ду ре­аб­сорб­ци­ей и сек­ре­ци­ей в поч­ках и ки­шеч­ни­ке. В поч­ках че­ло­ве­ка ре­аб­сорб­ция эпи­те­ли­ем пре­об­ла­да­ет над сек­ре­ци­ей, то есть у здо­ро­вых лю­дей ре­аб­сор­би­ру­ет­ся не ме­нее 90% про­филь­тро­ван­ных ура­тов, а вы­во­дит­ся ме­нее 10%. Тра­ни­ласт, про­ти­во­вос­па­ли­тель­ный пре­па­рат с раз­лич­ны­ми до­пол­ни­тель­ны­ми эф­фек­та­ми, ока­зы­ва­ет у че­ло­ве­ка вы­ра­жен­ный ури­ко­зу­ри­че­ский и, сле­до­ва­тель­но, ги­по­ури­ке­ми­че­ский эф­фект. В на­сто­я­щей ра­бо­те мы по­ка­за­ли, что тра­ни­ласт — силь­ный ин­ги­би­тор транс­пор­та [14C]-ура­тов, осу­ществ­ля­е­мо­го ос­нов­ны­ми ре­аб­сор­би­ру­ю­щи­ми транс­пор­те­ра­ми ура­тов (URAT1, GLUT9, OAT4 и OAT10) в яй­це­клет­ках ля­гу­шек Xenopus, и та­ким об­ра­зом яв­но по­ка­за­ли ме­ха­низм ури­ко­зу­ри­че­ско­го дей­ствия пре­па­ра­та. Тра­ни­ласт — об­ра­ти­мый и некон­ку­рент­ный ин­ги­би­тор URAT1 и GLUT9 (сме­шан­ный тип ин­ги­би­ро­ва­ния). Кро­ме то­го, он ин­ги­би­ру­ет сек­ре­тор­ные транс­пор­те­ры ура­тов NPT1, OAT1 и OAT3, не влияя на сек­ре­тор­ный эф­флюкс­ный на­сос ABCG2. Ин­те­рес­но, что бен­збро­ма­рон и про­бе­не­цид по­дав­ля­ют транс­порт как ура­тов, так и ни­ко­ти­на­тов, а тра­ни­ласт по­дав­ля­ет транс­порт мо­ле­ку­ла­ми URAT1, GLUT9, OAT4, OAT10 и NPT1 толь­ко ура­тов, не ока­зы­вая зна­чи­мо­го вли­я­ния на транс­порт ни­ко­ти­на­тов бел­ка­ми SMCT1 (IC 50 ~1,1 ммоль/л), SMCT2 (IC 50 ~1,0 ммоль/л) и URAT1 (IC 50 ~178 мкмоль/л). Итак, тра­ни­ласт сни­жа­ет со­дер­жа­ние мо­че­вой кис­ло­ты в кро­ви, по­дав­ляя ос­нов­ные ре­аб­сор­би­ру­ю­щие транс­пор­те­ры ура­тов и не за­тра­ги­вая при этом транс­порт ни­ко­ти­на­тов. Эти дан­ные мо­гут быть по­лез­ны для ле­че­ния ги­пе­ру­ри­ке­мии и по­даг­ры, по­ни­ма­ния фар­ма­ко­ло­гии тра­ни­ласта и струк­тур­но-функ­цио­наль­но­го ана­ли­за транс­пор­та ура­тов. Mandal AK1, Mercado A2, Foster A1, Zandi-Nejad K3, Mount DB1. 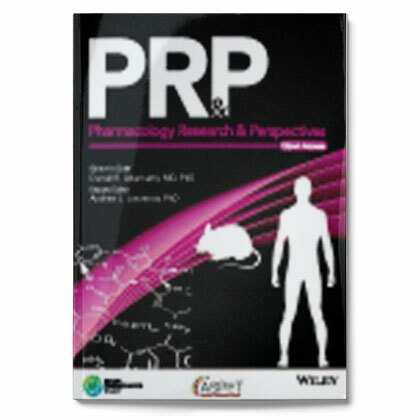 Pharmacology Research & Perspectives 2017 Feb 6;5(2):e00291. Uric acid, generated from the metabolism of purines, has both proven and emerging roles in human disease. Serum uric acid in humans is determined by production and by the net balance of reabsorption and secretion in kidney and intestine. In the human kidney, epithelial reabsorption dominates over secretion, such that in normal subjects there is at least 90% net reabsorption of filtered urate resulting in a fractional excretion of <10%. Tranilast, an anti-inflammatory drug with pleiotropic effects, has a marked hypouricemic, uricosuric effect in humans. We report here that tranilast is a potent inhibitor of [14C]-urate transport mediated by the major reabsorptive urate transporters (URAT1, GLUT9, OAT4, and OAT10) in Xenopus oocytes; this provides an unequivocal molecular mechanism for the drug’s uricosuric effect. Tranilast was found to inhibit urate transport mediated by URAT1 and GLUT9 in a fully reversible and noncompetitive (mixed) manner. In addition, tranilast inhibits the secretory urate transporters NPT1, OAT1, and OAT3 without affecting the secretory efflux pump ABCG2. Notably, while benzbromarone and probenecid inhibited urate as well as nicotinate transport, tranilast inhibited the urate transport function of URAT1, GLUT9, OAT4, OAT10, and NPT1, without significantly affecting nicotinate transport mediated by SMCT1 (IC 50 ~1.1 mmol/L), SMCT2 (IC 50 ~1.0 mmol/L), and URAT1 (IC 50 ~178 μmol/L). In summary, tranilast causes uricosuria by inhibiting all the major reabsorptive urate transporters, selectively affecting urate over nicotinate transport. These data have implications for the treatment of hyperuricemia and gout, the pharmacology of tranilast, and the structure-function analysis of urate transport. Tranilast inhibits urate transport mediated by the human urate transporter URAT1 expressed in Xenopus laevis oocytes. (A) Time course of [14C]‐urate uptake by control and URAT1‐expressing oocytes. [14C]‐urate uptake by URAT1‐expressing oocytes was trans‐stimulated by preinjecting with 50 nL of 100 mmol/L PZA or nicotinate (Nico) 2 h before [14C]‐urate uptake experiment. Urate uptakes in the control oocytes were identical, resulting in superimposed data. Inset, western blot analysis of URAT1 protein expressed in oocytes. (B) [14C]‐urate transport properties of URAT1: voltage sensitivity and Na+‐dependence was examined by replacing extracellular NaCl by KCl or LiCl. Chloride effects were also examined; for the 0 Cl− bath, NaCl was replaced by Na‐gluconate (Na‐Gluc), KCl by K‐gluconate (K‐Gluc), MgCl2 by Mg‐gluconate, and CaCl2 by Ca‐gluconate. *P < 0.001 compared with NaCl (ND96). (C) Trans‐stimulatory effects of preloaded organic anions on [14C]‐urate uptake by URAT1‐expressing oocytes: [14C]‐urate uptake rate via URAT1 was measured in URAT1‐expressing oocytes preloaded with 50 nL of 100 mmol/L Lac, Nico, PZA, PAH, BHB or salicylate (Sal). *P < 0.001 compared with water‐injected control; NS, not significant. (D). 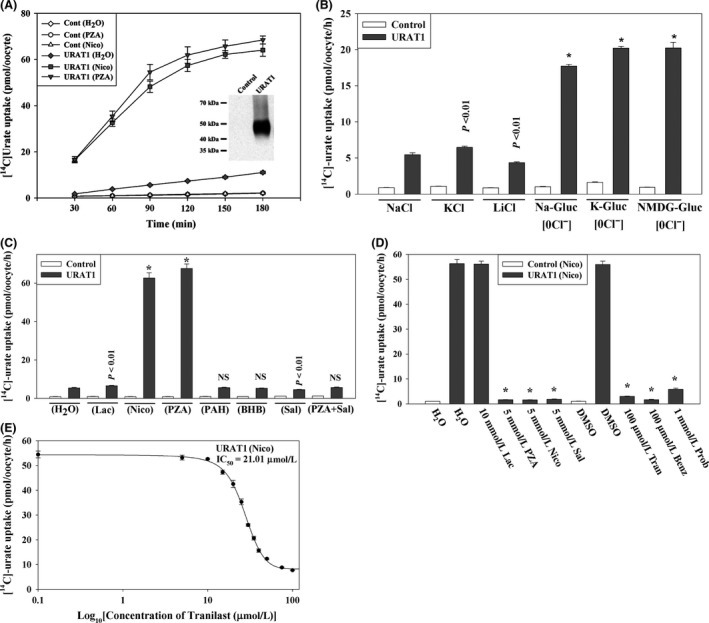 Inhibition of [14C]urate by URAT1 in the presence of extracellular organic anions or uricosuric drugs, including tranilast: the uptake of [14C]‐urate (40 μmol/L) by URAT1‐expressing oocytes in exchange of preloaded intracellular nicotinate was determined after 1 h in the absence or presence of inhibitors (uricosuric drugs or organic anions) that were added to the extracellular medium (pH 7.4) at the indicated concentrations. *P < 0.001 compared with DMSO. Tran, Benz, Prob, DMSO. Data are mean ± S.E. with n = 12–15. (E) The 50% inhibitory concentration (IC 50) curve of tranilast for [14C]‐urate uptake‐mediated by URAT1 in oocytes preloaded with nicotinate. PZA, pyrazine carboxylate; PAH, para‐aminohippurate; Tran, tranilast; Benz, benzbromarone; Prob, probenecid; DMSO, dimethylsulfoxide. Pharmacol Res Perspect. 2017 Apr;5(2):e00291. Tranilast inhibits urate transport mediated by the human urate transporter GLUT9a. (A) Time course of [14C]‐urate uptake by control and GLUT9a‐expressing oocytes. Inset, western blot analysis of GLUT9a protein expressed in oocytes. (B) [14C]urate transport properties of GLUT9a: voltage sensitivity and Na+‐dependence was examined by replacing extracellular NaCl by KCl or LiCl. We also assessed [14C]‐urate uptake by GLUT9a in the absence of extracellular Cl− ion (0 Cl−); in 0 Cl− bath, NaCl was replaced by Na‐gluconate (Na‐Gluc), KCl by k‐gluconate (K‐Gluc), MgCl2 by Mg‐gluconate, and CaCl2 by Ca‐gluconate. Asterisk, P < 0.001 compared with NaCl (ND96); NS, not significant. 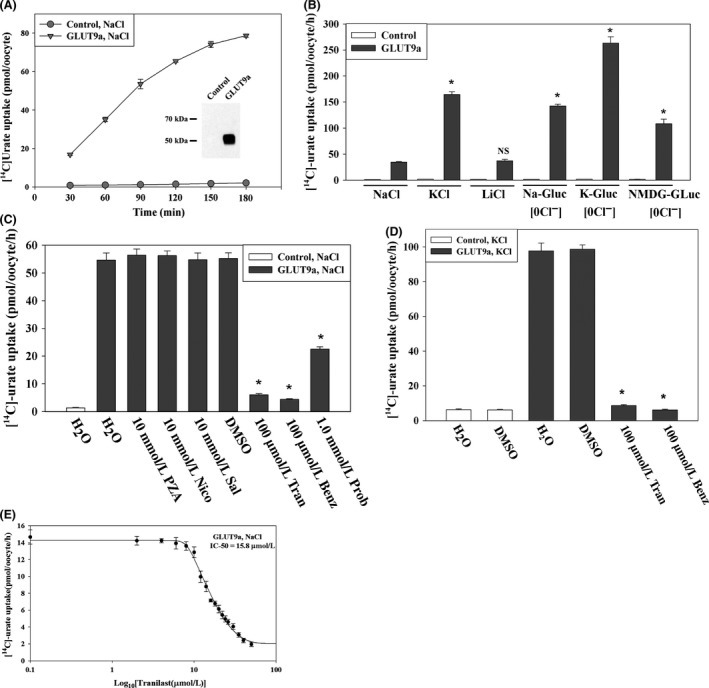 (C) Inhibition of [14C]‐urate uptake by GLUT9a in the presence of antiuricosuric or uricosuric drugs: The uptake of [14C]‐urate (40 μmol/L) by GLUT9a‐expressing oocytes was determined in complete absence of Na+(NaCl of ND96 medium was replaced by KCl) after 1 h in the absence or presence of inhibitors (uricosuric drugs) which were added to the extracellular medium (pH 7.4) at the indicated concentrations. *P < 0.001 compared with DMSO. (D) Inhibition of [14C]‐urate uptake by GLUT9a in depolarized cells. The uptake of [14C]‐urate (40 μmol/L) by GLUT9a‐expressing oocytes was determined in the complete absence of Na+ (NaCl of ND96 medium was replaced by KCl) after 1 h in the absence or presence of inhibitors (uricosuric drugs) at the indicated concentrations. *P < 0.001 compared with DMSO. Tran, Benz Prob, Sal, DMSO. Data are mean ± S.E. with n = 12–15. Data are mean ± S.E. with n = 12–15. (D) The 50% inhibitory concentration (IC 50) curve of tranilast for [14C]‐urate uptake via GLUT9a. Tran, tranilast; Benz, benzbromarone; Prob, probenecid; Sal, salicylate; DMSO, dimethylsulfoxide. Что определяет разный характер воспаления при подагре?